Resume posted by Joejreynolds1@gmail.com in Theatre. 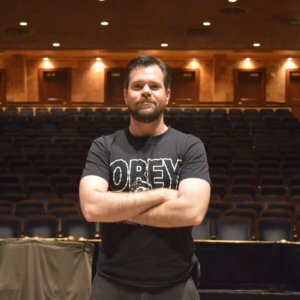 Experienced audio professional with 20+ design credits and over 500 performances at Front of House. Will travel/tour. Excellent references upon any request. Proscenium Theater, Theater in the Round, Immersive Theater, 3/4 Thrust, Outdoor Theater, Location Recordist, Remote and Traditional Orchestra Pit, System Networking, Analog and Digital Expert, Sound FX Design (Practical/Hard), Mentorship (T.Y.A-Seniors), Head Audio/Supervisor/Dept. Head, Radio frequency coordinator, Practical equipment designer/fabricator, Audio for T.V./Film/Video, Video Recording/Editing. Sarasota, Florida (2016-2019 Seasons) Current. • Worked closely with technical staff regarding the A/V needs of a large venue theater. • Audio/video archiving of performances. • Setup/strike/microphone placement of orchestra pit to strict specifications. • Liaison for visiting/rental productions and A/V crew. •Maintenance and repair of sound/communication equipment. •Managed all audio/visual systems in a brand new multiplex performing arts center. •Mixed front of house for performances and designed majority of productions in multiple configurations and sizes of theater. • Installed/maintained/repaired all aspects of sound reinforcement/video/communication. •Implemented designs and integrity of other designers. •Instructed apprentices and oversaw their designs of T.Y.A. Productions. • Mixing FOH and monitors for 22 cast members on mic, and 4 musicians in orchestra pit. • Recording talent voice and music for live playback. • Setup and maintenance of house sound in medium size theater. • Attended daily production meetings with technical crew. • Assisted cast/musicians with demo reel material for future prospects. • Daily setup/strike of stage/orchestra pit/various performance areas. • Adhered to sound designers concept. • Playback of hard sound fx during performances. • Collaboration with creative and technical staff about unique situations posed by immersive theater. • Owner/operator of audio recording/mixing/editing/mastering suite. • Various “audio cleanup” and sound editing projects for video post production. • V/O and music production. • Achieved semifinalist status with professional and amateur talent/crew. • Console operator for all performances. • Worked closely with students and employees of Milton Bassin Performing Arts Center at City College of New York, York College campus. • Implemented “silent pit” monitoring system for increased house audio control and voice intelligibility. • FOH and monitor engineer for 16 singers and up to 5 orchestra pit members for all season performances. • Recorded, edited, and designed sfx and V/O recordings for playback during performances. • Served as teacher for student apprentices for theater audio and oversaw student design and implementation of TYA productions of “Jungle Book”, “Wizard of Oz”, “Cinderella”, “Sleeping Beauty”, and the end of season Apprentice Showcase. • Attended daily production meetings. • Maintained/Repaired house audio equipment. • Scheduling and producing live entertainment for local venue. • Liaison between talent and venue management. • Mixing appropriate house and monitor mixes for various local/national/international acts. • Assisted with audio feeds for video recorded events. • Set up/strike of sound reinforcement equipment. • Audio and video tracking for a local 24 hour news television station. • Loading on air playback. • Editing video segments for broadcast, and assisting anchors, photographers, and reporters with technical aspects of televised broadcast.